So, "Sir" Alex Ferguson has written a book about himself, telling the world about all the slights he suffered while manager of Manchester United and how he was right in every case, just as Man U should have won every title for 26 years, if not for some appalling refereeing decisions. Perhaps the expression "let sleeping dogs lie" should have come to mind before he published it as he has at best simply shown how much everyone got under his skin during his career. As a result of the book he has been slapped down firmly by several of the people he wrote about and has been accused of being unprofessional for breaching dressing room confidentiality. It will never have occurred to him that there is some sort of conflict of interest in rushing out such a self-serving book (in time for Christmas) while his successor is struggling with the poor squad he has been left. Any more than he would have thought that suing a fellow director of MU when he was still manager might be exactly the sort of sideshow which he accused David Beckham of creating. The hypocrisy and arrogance of the man are staggering. 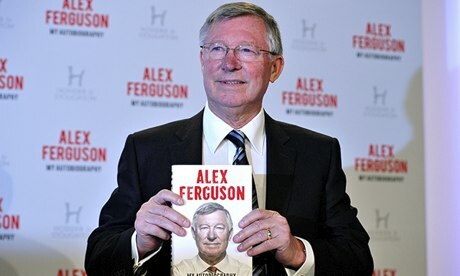 Just in case there is any doubt, Fergie is shown as the author and the title is given as "My Autobiography". Well, who else's would it have been, if he wrote it, the daft Jock? Yes, it's by you, about you, and to line your own ckufing pockets. You, you, you. We get it. Oh dear, Mr. Fumier, you forget the audience for which the tome is intended - Football Hooligans. Granted few, in any, are indeed lettered enough to read it, but I'm sure it has plenty of pictures and will look smashing on a bookshelf. The tautology of its title is of no consequence. Fair comment from a fair maiden, but someone has to kick against the pricks. We should be thankful, perhaps, that the book was not entitled "Alex Ferguson, My Autobiography Wot I Wrote All By My Own Self".